CONICET researcher describes the behaviour and some particularities of this bird that, among other species, has the largest number of individuals in all Patagonia. Magallanes penguin. Photo: Marcelo Bertellotti. There are about a million couples of penguins in the region. 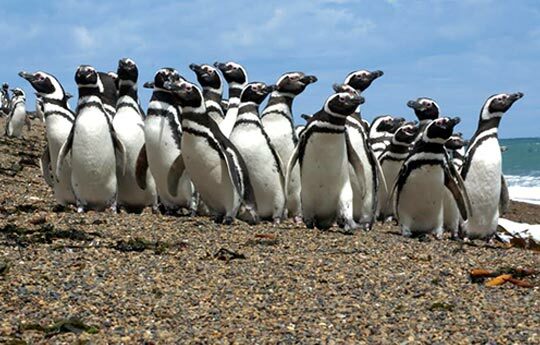 “One can imagine that the seagull is the most abundant bird in Patagonia; however, penguin populations are ten times larger and have very interesting social lives”, Marcelo Bertellotti, CONICET independent researcher of the National Patagonian Centre (CENPAT-CONICET), comments. In the social imaginary, penguins are associated with polar climates. However, the Magallanes, Humboldt, and the South African penguins are four species of the same genus that are called “penguins of temperate waters”. “Along their migratory routes, Magallanes penguins tend to reach places with high temperatures. This species leaves Patagonia chasing shoals of anchovies and goes up through the Atlantic towards the south of Brazil. They could even get to the height of Rio de Janeiro”, Bertellotti states. Besides, according to the researcher, being exposed to low temperatures modifies some behaviors in the animals. The Antarctic penguins tend to concentrate and approach one another to withstand the cold or snowstorms. Emperor penguins, for instance, form a great mass by joining their bodies as a strategy to keep the heat and take turns to be either in the most exposed places of the periphery or in the protected areas, in the central part. Sea birds in general are monogamous and penguins are not the exception. Couples that get together to mate certainly will meet the following years. They remain together during reproduction, for the six months in which they happen to be on land, and separate when migrating. In the following spring, the males come back to the same nest in which they used to be the previous season and they meet again with the females. “This custom is repeated year after year but funnily divorces exist. Penguins tend to change their partners after a reproductive failure and that is the most probable explanation to understand the cause of the separation. Incidentally, divorces between penguins occur around the seventh year”, Bertellotti comments. Some sea animals, such as dolphins, are regarded as highly intelligent; however it is not common to have that opinion about birds and particularly penguins. Vasco da Gama, the explorer, described them as “silly birds”. That statement could be contradicted by some of this species’ behaviors associated with memory. For the researcher, the penguin is completely amphibious. It spends most of its life on land to nest, laying eggs and raising offspring but half of its life happens only in the sea. For instance, one animal that swam from Punta Tombo up to Río de Janeiro spends six months in the water and accurately comes back to its home. “Penguins have cognitive memory that allows them to find and come back to their nest, which is a tiny place they had left the previous season after crossing the great sea”, Bertellotti argues. 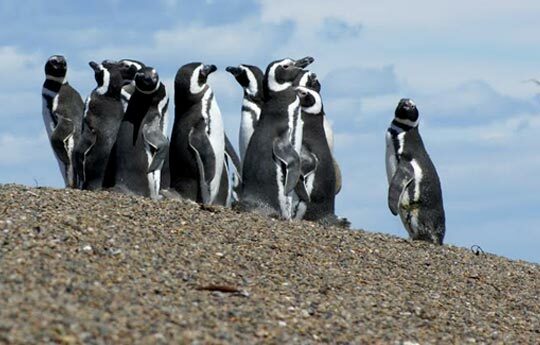 In 2013, Marcelo Bertelotti published Pingüino de Magallanes: Embajador de la Patagonia in order to provide the public with information, photos, statistics and detailed information of the lives of these singular birds.